A report by a World Health Organization Independent High-Level Commission released today proposed six bold recommendations to address the global epidemic in chronic diseases – especially in poor nations – and strongly urged governments to take the lead in creating health protecting environments through robust laws, dialogue, clear objectives, transparency and agreed targets. The President of Uruguay and Commission Co-Chair, Tabaré Vazquez, who presented the report to the WHO Director-General Tedros Adhanom Ghebreyesus (Dr Tedros) at the agency’s headquarters today, called on world leaders “to redouble efforts” to meet the UN Sustainable Development Goals target to reduce premature death from NCDs by one-third by 2030 and to promote mental health and well-being. He told reporters afterward that NCDs “are a silent threat,” noted they are not given enough awareness and said the challenge was to draw attention to the threat. “The NCD epidemic has exploded in low-and-middle-income countries over the last two decades. We need to move quickly to save lives, prevent needless suffering, and keep fragile health systems from collapsing,” said Commission Co-Chair Sania Nishtar, a former minister of health of Pakistan and a renowned cardiologist. The report outlines that while “many proven interventions for NCDs exist, many countries are lagging behind in implementing them” and goes on to list some of the obstacles. These include: lack of political will; lack of policies and plans for NCDs; difficulty in priority setting; the impact of economic, commercial and market factors; insufficient technical and operational capacity; insufficient financing to scale up national NCD responses; and lack of accountability. 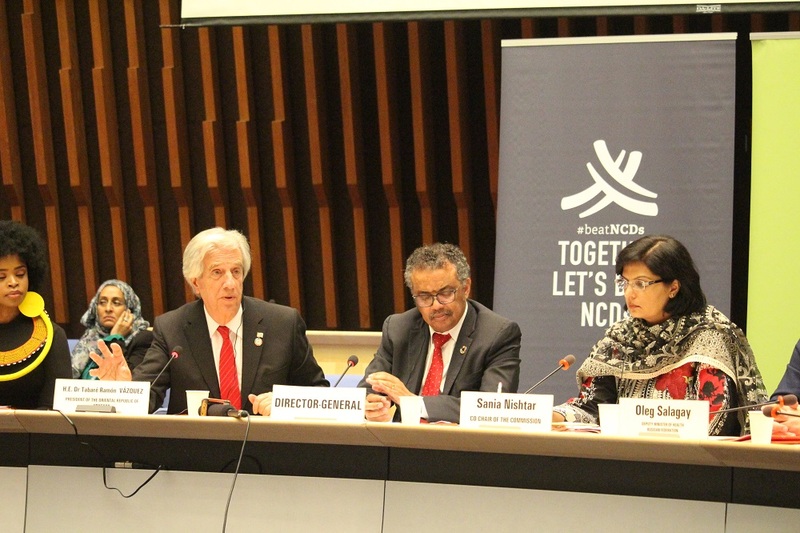 Heads of State and Government must take responsibility for the NCD agenda, and stress this responsibility cannot be delegated solely to ministries of health, as many sectors including finance, trade, agriculture education, environment and others, have an impact on risk factors for NCDs, as well as how governments can tackle these and therefore must be involved and coordinated for effective action. Top health diplomats, speaking on condition of non-attribution, told Health Policy Watch that the United States “was unrelenting” not to have a tax on sugar-sweetened beverages reflected in the report. “This has been an issue for many years,” noted a senior Western diplomat familiar with the sugar tax issue. Eric Hargan, US Deputy Secretary of Health and Human Services, is a member of the 26 member Commission. Tax on sugar-sweetened beverages is listed by the WHO among its “good buys” in combating NCDs but are not part of its “best buys” such as taxing tobacco products and alcoholic beverages are. But Dr Tedros noted WHO’s position – on a sugar tax – cannot change because of the Commission report and noted about 30 countries including the Philippines, South Africa, Ireland, the United Kingdom and Mexico, have already introduced fiscal measures to limit sugar consumption which has been linked to obesity. But unlike the politically balanced and consensus Commission report, a report prepared by Dr Tedros on NCDs for the recently held World Health Assembly (19-25 May) was more explicit about the political impediments and commercial factors impacting NCD health policies. “Interference by industry impedes a number of governments in implementing some of the best buys and other recommended interventions for the prevention and control of noncommunicable diseases, including raising taxes on tobacco products, alcoholic beverages, and sugar-sweetened beverages, and enacting and enforcing bans or restrictions on exposure to tobacco and alcohol advertising, promotion and sponsorship,” the WHO report said.